Let's see. I've got this delicious bacon but I really need it to be more portable... what to do? Bacon Freak has come up with what is quite possibly the world's greatest snack idea... at least for us meat-eaters: Bacon Jerky. 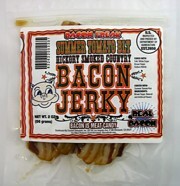 And it's not just bacon jerky, it's several different varieties of bacon jerky! Get yours today at BaconFreak.com, where their motto is "Bacon is Meat Candy!"